I woke up Thursday morning with a backache, nothing new, I was almost 38 weeks pregnant and backaches come with the territory. In the late afternoon I began having very sporadic contractions, not ones that I had to breathe through or concentrate on, but not Braxton Hicks. They picked up a bit in the evening, just enough that I asked Nick to not go into work that night. But then by 9pm they were sporadic and dwindling in strength. We watched an episode of Alias on DVD and went to bed. I slept hard and good, not sure I even woke up once to go to the bathroom. That was until 3:28am – I was awoken by a CONTRACTION. I was lying on my side in bed and was frozen in pain. I gained composure right as it was ending and thought maybe I was dreaming. I lie there awake and a few minutes later, another contraction. Not wanting to wake Nick unless it was necessary I got into the shower. I’ve never much been for baths in labor, I can’t move around enough. The shower allowed for change of position and rocking. I made it in the shower until just before 4am. I was in a lot of pain and the contractions were getting stronger, so I woke Nick. We both agreed that this was it. We were going to have a baby and soon. In the weeks leading up to Lyric’s birth, Nick and I discussed options. 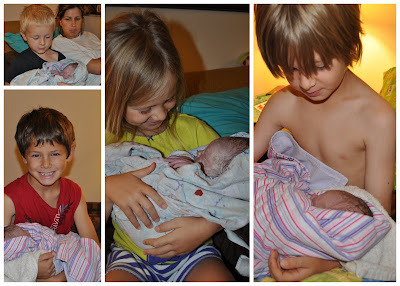 Since we had gone “back on the road”, a homebirth in St. Louis with our midwife was not an option. So basically we had two options; when I went into labor we would go to the local hospital where I would labor with nurses I didn’t know and be delivered by a doctor I didn’t know, while Nick and the children waited in the waiting room OR we could gather birth supplies and have her wherever we were, just us. I had been researching, more like avidly studying unassisted birth since I was pregnant with Dillon (who ended up being born in the car). We prayed about our decision and knew it was the right one. We decided to go unassisted, all the while knowing that if either of us felt uncomfortable or worried we would call 911. We had everything we needed, herbs, chux pads, cord clamps, Doppler, a shower curtain liner to put under sheets, and many other random birth items. I had books; Heart and Hands, Wise Woman Herbal for the Childbearing Year and Spiritual Midwifery. The children were all asleep, the older four in beds on the other side of the half wall in the hotel suite and Jericho in a bed made on the floor on the other side of the sofa bed. I never once worried about waking them, I knew if they woke it would be fine, it would be the right time. The contractions were coming closer and they were lasting longer, it was past 5am. Between a contraction I told Nick we (actually meaning he) should probably get stuff ready for the birth. I wasn’t sure where I would give birth and since we were in a hotel, we decided to be overprotective. Waterproof pad (aka shower curtain liner) under our sheets on the fold out sofa, chux pads on the floor on top of the pillows I was kneeling on and extra chux pads in the bathroom. Also, he set out the scissor, cord clamp, herbs, my 3 books, my notes, bowl for the placenta and extra towels. He was amazing, doing all this in the very limited time between contractions and coming right back to me when he could tell another was starting. Not having a clock nearby I am not sure the timing of the final stage of the labor. I began feeling pushy, but also knew it wasn’t time just yet. I continued through a few more contractions, still hurting immensely in my back. I was 99% sure she was posterior (like Téadora was) and thought I felt her rotating during contractions. I checked myself and felt that I was complete except for a little lip (cervical lip)…I had heard about lips, read about lips, but never knew exactly what it meant until I FELT a cervical lip. I pushed/stretched the lip (it was super easy, just like it wanted to be moved) and was now 100% dilated. The bag of waters was still intact. At this point I was really bearing down with each contraction, but wasn’t trying to push. Being on my hands and knees didn’t feel right anymore. I am not sure what it was, but I NEEDED pressure on my back and the amount of pressure Nick could give wasn’t enough. And as I think back, I think I needed to look at him and focus with him, while pushing. So I got up onto the sofa bed and my body took over. Nick was everything to me during these last moments of labor. I was squeezing his hand, pushing on him with a foot (and all my might), needing his eye contact and wanting constant updates about the baby. Her bag of waters was protruding and then right as her head was crowning the back of waters ruptured…it happened right as a contraction was ending, so I sat for what seemed like forever with her head RIGHT there, ring of fire to the fullest. She came a bit further, her head all the way out, the cord was around her neck and Nick couldn’t slip it off. I leaned forward and with on little sweep, the cord was free. With one more contraction she was out. She was born into Daddy’s hands and then brought up to my chest with my hands. Oddly enough, she was neither born posterior or anterior…she was born with her face facing the inside of my right thigh. The only thing I can come up with as to why that was, is that she was posterior and was rotating in labor like I thought and didn’t make it all the way; either due to lack of time or her cord being around her neck. During the last minutes of the labor, Jericho popped up from beside the bed, Dillon & Téadora peaked around the corner. And as she was coming up onto my chest Aidan & Coda came around also. They all kneeled and watched as their little sister had her first moments. We had NO idea what time she was born, we looked at the clock it was 6:04am. Nick and I were trying to guess how long it had been. And then Aidan said, “it was 5:58 when Dad said she’s out and I heard her little cry.” Well that settled it; Lyric Elizabeth was born on August 5, 2011 at 5:58am in a hotel outside of Oklahoma City, OK.
A bit later a dear friend and her children were our first visitors. They had been visiting us on their way back to Texas and just happened to be there for her birthday! And then later that day Nick bought a scale. She weighed 6lbs and was 20in long. I have had such a hard time putting into words what those 2 ½ hrs were to me. Lyric’s labor and birth was the MOST amazing experience of my life. I listened to my body, fell deeper in love with my husband and relied fully on my Father in heaven. The labor and birth felt SO natural, Nick and I just flowed together, there was little talking and less questioning, and it was as though we had done it 100 times, felt like we were “old pros”. Her birth was a truly healing experience. Jericho was born just over 2 years ago, by emergency c-section, he & I almost didn’t make it, I was hemorrhaging due to placenta previa. After his birth I was scared, so scared it would happen again and even more so that the outcome wouldn’t be positive. Lyric’s pregnancy and birth healed me, took away my fears and was beautiful. One last thing, I am so very thankful for the amazing family and friends and strangers that we have had in our life through this. I expected negativity and rudeness, I expected to be treated as if we did something wrong. And I am so happy to say that we weren’t. We weren’t looked down on for going about this birth the way we did, we were supported, loved and our decisions respected. And for that I am forever grateful. More photos of Lyric Elizabeth here. WOW!!! Such a beautiful birthing story! The second unassisted hotel birth I've read in the last few weeks. You and your husband did everything right for this birth. Thank you for sharing! She's adorable, congratulations! I am pregnant with #4, planning home birth #3. I have thought about planning a UC, a couple times, but dh feels more comfortable with a cpm. Still, this will be our first baby born in a camper! Thank you for sharing your beautiful story.